Stef’s, off Oxford Street – an Italian restaurant with friendly service and gut-bustingly good dishes; offers a reasonable prix-fixe menu with several delightful options. Cocochan, Marylebone – a lounge-y Pan-Asian restaurant with a variety of cuisines including sushi and dim sum – utterly delicious and a nice mellow atmosphere. Nikita’s Restaurant, Earls Court – an intimate, atmospheric Russian restaurant with the longest list of vodkas I’ve ever seen—try the caramel one! Dishes are deceptively modest in size and will fill you quickly; we scored a Groupon for this one and had 4 courses, including caviar and dumplings to start. I should also mention that we met for pre-dinner cocktails at the Finborough Wine Café, also in Earls Court and which has a theatre upstairs – the Saint Clair Sauvignon Blanc there is divine. The Vale Bar, East Dulwich – a spacious pub with a darling beergarden in back. Good ales on tap and decent pub fare. The Pembroke, Earls Court – feeling a bit peckish after a journey back to west London, we stopped in this gastropub for a nice bottle of wine and gourmet salads. Lovely, recently renovated ambiance with flowery wallpaper and twinkling chandeliers. Nice when opting for non-traditional pub fare. Paramount, Tottenham Court – cannot recommend this restaurant highly enough! Located in the Centre Point building, this restaurant enjoys a 360-degree panoramic view of London. Take a lap or two around the upstairs viewing gallery with a cocktail before you’re seated at your table to feast on flavorful, contemporary spins on British dishes. We had a table with a view of London’s major sites along the Thames, like the London Eye, St. Paul’s Cathedral, and Tower Bridge. Booking Office, at St. Pancras Renaissance Hotel – a gorgeous space of architectural interest just adjacent to the St. Pancras rail station—you could literally grab a drink here then step right outside to catch the Eurostar to Paris! With cocktails harkening back to Victorian times, this classy bar and restaurant offers a range of quality snacks and British fare. Sports Bar and Grill, Marylebone Station – ’nuff said. What can I say, it was an ideal place to meet an American friend who had traveled into Marylebone’s rail station from outside London only to commute that same afternoon to City Airport to fly home to the States. More upscale than sports bars I know from home, this is still a great casual meeting point easily accessed by the tube and within close walking distance to Marylebone’s high street. Good beers on tap and pub fare. Caffè Vergnano, near Leicester Square – bears repeating as the place where I swear Jesse Tyler Ferguson of Modern Family held the door open for me last week (see “Relocation to London – The Secret of Celebrity-Spotting in London“). I enjoyed a most deelish and creamy cappuccino here with a little, spongy Madeline cake. 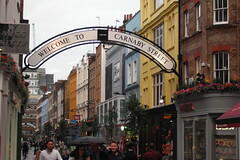 Close to Leicester Square tube, cozy interior and friendly service. Sacred Café, Carnaby Street area, Soho – just hit this one today, in fact. A New Zealand café with gourmet coffee, herbal teas, and a nice selection of sandwiches and salads or cakes for your sweet tooth. Tea is served in a darling, eclectic assortment of pots. Tucked away in the quieter alleys of Carnaby (just off the bustle of Regent Street), this is a quaint spot to stop before or after you indulge in some shopping at nearby Liberty! So there’s a little supplement to our usual relocation services of finding you a proper London apartment to rent. This is the fun to look forward to when the details of your international relocation have been hashed out and you’re ready to settle in and hit the town! You can be sure I’ll continue to share my discoveries as I likewise explore more of London after my own relocation to the UK.